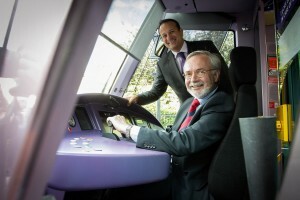 All systems go: EIB President Werner Hoyer takes the controls of a Luas tram with Minister Varadkar. Following a meeting with Minister for Transport, Tourism & Sport Leo Varadkar, the President of the European Investment Bank, Werner Hoyer, has confirmed that the bank is considering providing funding to the Luas Cross City line. Minister Varadkar and President Hoyer reviewed the EIB’s involvement in transport infrastructure over recent years and today discussed the potential for EIB funding to assist with suitable future transport infrastructure projects. “I can confirm today that the EIB has expressed an interest in providing a loan to assist with funding the Luas Cross City Line. Government officials are now engaging with the EIB on the loan application for this project. 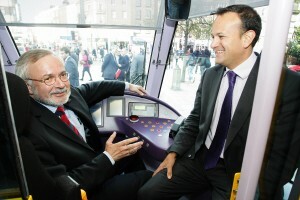 Enabling works for the Luas Cross City are due to start in the next few weeks. The project is already financed from the Department’s capital programme. However, funding from the EIB has the potential for the project to be financed by the State on more favourable terms,” Minister Varadkar said. Minister Varadkar also confirmed that State-owned port and airport companies have development plans and are examining the eligibility for EIB loans for particular projects. This includes Shannon Airport which has discussed its own plans for further development with the EIB. Meanwhile, President Hoyer welcomed confirmation that the Public Private Partnership (PPP) to fund a motorway on the N11 between Arklow and Rathnew, which is bundled with a free-flow system at Newlands Cross on the Dublin-Limerick Road, is now ready for signature in the immediate future. The EIB explained that if the N11 deal is finalised, it would be the first transport PPP to reach financial close since 2007. The successful closure of these projects would provide further evidence of restored confidence in Ireland’s long-terms prospects. The involvement of the EIB and Bank of Ireland has been crucial to bringing negotiations into the final stages, at a time when no transport PPP has been agreed for the last six years. The EIB added that it has agreed in principle to fund the N17-18 Gort-Tuam link road. President Hoyer confirmed that it will now be considering applications for funding the N25 New Ross bypass and the M11 Gorey-Enniscorthy roads. These three projects are part of the Government’s stimulus package announced last year. In particular President Hoyer noted the very successful involvement of EIB in the first roads PPP Programme which played an important part in the delivery of the major Inter urban motorways which have transformed the road system and improved connections across the country. If successfully concluded, the next three PPP road projects – N17-N18 Gort-Tuam link, the N25 New Ross bypass and the M11 Gorey-Enniscorthy these PPP projects – would provide a welcome boost to Ireland’s construction sector as well as generating significant long-term economic benefits.